Here is how she looked when I found her. Sadly her original drawer handles were all broken or damaged. The the woodwork was in desperate need of restoration. Here is the one and only original drawer handle which was in tact. Gorgeous, right? First of all I sanded back the entire top of the desk. Then I used black chalk paint to paint the bottom of the desk and all the drawers. I wiped off sections of the paint with a wet cloth to create an aged effect. I love how it turned out. So much less time and mess than sanding. I was lucky enough to find some very similar drawer handles on ebay to replace the old ones. Then I applied a clear coat of varnish to the entire desk, and 3 coats to the top. And lined all the drawers with original old sheet music. And here is my new desk. I just love it. It's a total keeper. On top I've displayed this original old Public Service Notice Bulletin from 1974. It makes great reading. And my "You Are My Sunshine" sign I made a few year back from a secondhand cupboard door. This is the first piece of furniture I have been brave enough to paint black, but wow, I'm so happy I did! Love your desk and love you "sunshine" sign too. 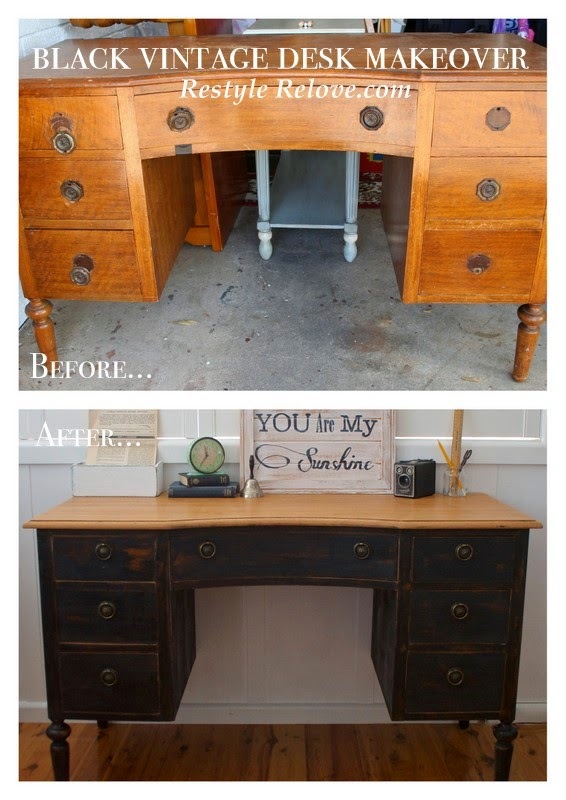 This is beautiful, love how you refinished the wood top also, looks beautiful. Desk look amazing ... very inspiring! Thanks for sharing on @abowlfulloflemons. This is beautiful. I have question though and I hope it is not too dumb. When you wiped off the paint with a wet cloth to create the distressed look was the chalk paint dry? Does it just wipe off? Or was it still wet and you went over it to remove some of the paint? See..it is sort of a dumb question but I just started using the chalk paint and I like it a lot. I would love to do more projects like this using it. Thanks! Stunning makeover and I love the rubbing technique! Love everything about it--the color, hardware, original top--GREAT JOB!